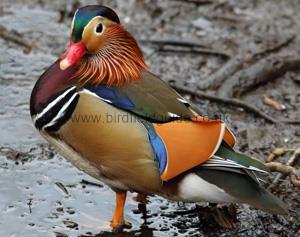 The Male Mandarin in breeding plumage is a stunning bird, unlikely to be confused with any other. Note the chestnut ruff and raised feathers on the birds back. The Male Mandarin duck in Winter and Spring is an exotic looking bird, he has a green and purple crest, chestnut ruff, and a broad white stripe from his eye down his neck. His back feathers are shaped to form a raised display and he has a large head with a small red bill. The Mandarin is an Asian duck introduced to European Wildfowl collections in the 20th Century. Since then escaped birds have populated many areas. Found mostly in the South of the UK there is thought to be around 7000 'wild' Mandarin. Most Mandarin in Europe are sedentary and do not migrate. It is thought that the Mandarin population would increase drastically if it was not for the shortage of suitable nesting holes in trees where it completes with Jackdaws and other birds. The Mandarin is a a duck which nests in tree holes and hanging nest boxes. It frequents freshwater lakes and ponds surrounded by trees and bushes, often in parks. In Summer the Male is much duller, he looses most of his decorative plumage, his bill is a dull red and he has similar head markings to the Female. His body is generally much browner and less grey than the female and his bill is brighter. The Males facial marking tend to be less obvious than the Females. 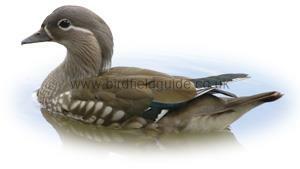 The Female Mandarin duck has a distinctive pale eye ring and a pale line behind the eye. It's bill is small and grey and it's neck and head are two tones of grey/brown. The flanks and breast are speckled and it's throat is pale. 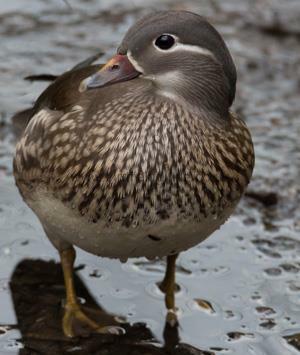 Note the speckled breast and distinctive facial markings of this Female Mandarin. The bill is dull and she has a white throat.